The entertainment facility features a long and varied list of attractions - from a five-star hotel to a dolphinarium, a wildlife park and a very promising waterpark. The waterpark part of the project is called "Legend of Aqua." Developers of the project are a collaboration between Rixos World Parks & Entertainment (Serik, Turkey), Emaar Real Estate (Dubai, U.A.E.) and global cultural creativity brand Dragone Productions (La Louvière, Belgium). Multidisciplinary design firm founder Jack Rouse was in charge of developing specialized zones for the facility and oversaw its master planning, concept and schematic designs. 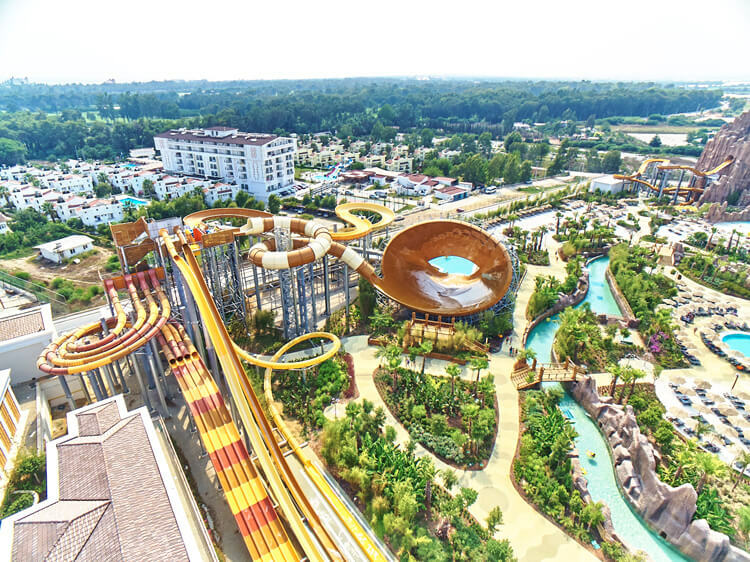 Polin Waterparks delivered a wide assortment of waterslides, in addition to a water playground, a spray zone, wave and river systems, a SurfStream®, a Wave Ball and an entire hydromechanical sytem, including water circulation and filtration to the park.